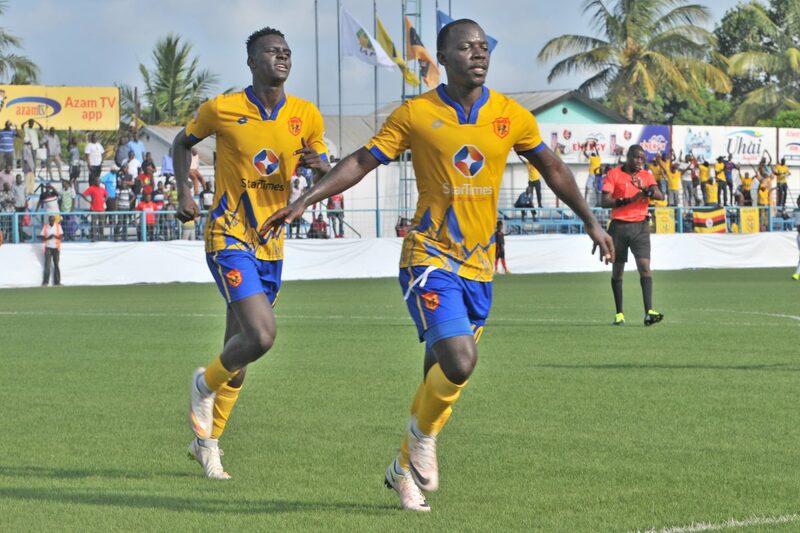 DAR ES SALAM – KCCA FC defeated Mtibwa Sugar 2-1 at the Chamazi Stadium in Dar es Salam to qualify for the next round of the CAF Confederations Cup 5-1 on aggregate. Going into the game having won the first leg 3-0 at Lugogo, the Kasasiros who had lost all of their 5 Confederations Cup games prior to Saturday knew that they only had to avoid defeat or lose by just two to march onto the next round. However, Mike Mutebi’s side did it in style with Muzamir Mutyaba scoring inside the half hour and Allan Okello winning it at the death after Salum Kihimbwa had equalized at the start of the second. Mike Mutebi known for his belief in the young players handed teenagers, Steven Sserwadda and Eric Ssenjobe their continental debuts and another junior team graduate Herbert Achai was introduced later. From the onset, KCCA FC were on the front foot. Okello dribbled past goal keeper Shabaan but his effort went wide inside three minutes of play. Three minutes later, Mutyaba had the game’s real first moment of offensive promise but his effort also went wide. An exhibition of flawless football saw Nunda, Sserwadda, Bukenya and Mutyaba interplaying but the former shot sailed wide of the upright. The hosts then capitalized on sloppy defending from KCCA FC but Kibaya’s effort was pushed out for corner kick by Lukwago. A minute later Mutyaba played a through ball for Okello who beat his marker and played back to the shirt number 10 who scored with his immediate touch on the ball from a tight angle. In the 41st minute, Lukwago acrobatically saved Kibaya’s goal bound shot and with a minute to half time, Okello whipped the ball towards goal but somehow Shabaan saved. After the recess, the hosts drew level courtesy of Salum Kihimbwa’s header in the 51st minute and immediately introduced Chanongo Haruni for Mhesa Ismail in search for more goals. Gift Ali was replaced Nunda for KCCA’s first change and the midfielder increased fluidity in the middle of the pack. Sserwadda would have recorded a goal on his first continental game but he floated the ball high over the bar from a well placed pass by Okello on 69 minutes. The hosts had Msuya Riphat come on for Luizio Juma and Isihaka Hassan for Mbeiky Dickson while KCCA FC introduced Mike Mutyaba for Sserwadda and Achai for Kyambadde. With two minutes to play, Muzamiru Mutyaba recovered possession deep in KCCA’s half and played a 40 meter pass to Okello who beat his marker Cassian and slotted past Shabban in fine style. 1-2 the final score. KCCA FC 1-5 aggregate winners against Mtibwa Sugar SC and qualifying for 2nd final 1/16th round. KCCA FC will wait for draws to be held later this month to know who they will face in the next round. Shabaan (GK), Salum, Mbeiky (Hassan), Nditi (c), Mhesa (Channongo), Cassian, Saleh, Kihimbwa, Kibaya, Juma (Msuya), Issa.